This walk takes you past the ruins of Lecythus fortress at the south end of Toroni beach and along the coastline to an isolated small beach. 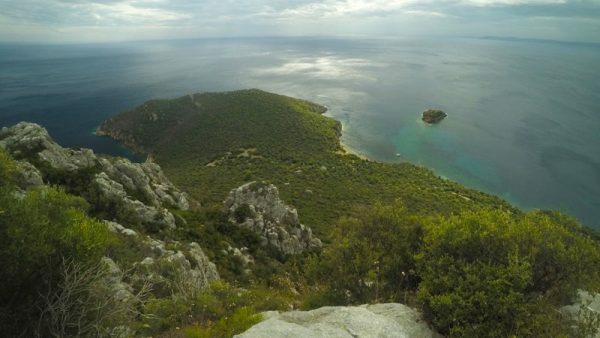 From the highest point on the trail, you will have a beautiful view of Toroni and the wide open bay from above. 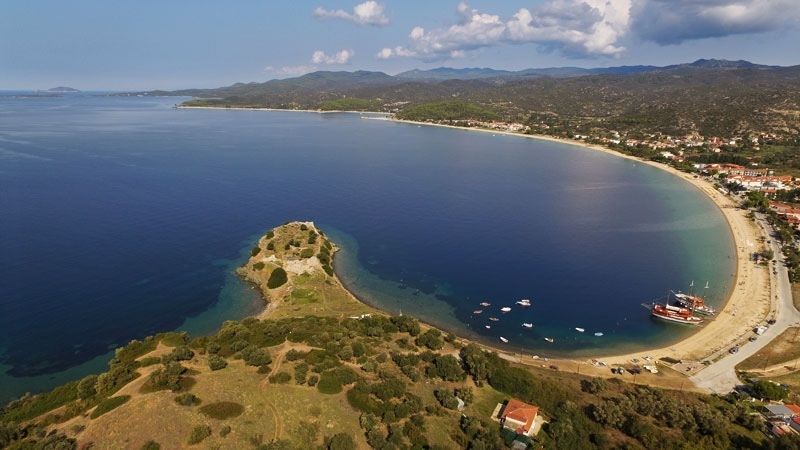 Head south along Toroni beach till you reach the ruins of Lecythus fort. This is located on a point about 500 m from the hotel. 0.5 km Lecythus fort At the base of the peninsula where Lecythus is located (at the south end of Toroni beach) there is a dirt trail going to the left (south). Follow this trail. After a couple hundred metres, the trail forks. Take the path on the right and it will lead you to the coast where you can get a nice view. Take a look along the shoreline south and you will see the beach which is your destination. 1 km Viewpoint Now go back on the trail and return to the fork. Take the other route going South. Sometimes the trail can get lost as it can be grown over, but it continues to follow the coastline. Be aware of thorns on some of the bushes. On this path you can get a good view of Toroni looking back. From the viewpoint it is about another 500 m to the beach. This is not a trail, but a marketing gag by a local hotel, which is trying to promote this area to attract guests. The trail cannot be passed completely. Locals use boats to get to the hidden beaches. There are roses, dorns, snakes all along the paths. Most of the ways are closed and obviously dangerous. Either due to stones falling from the mountains, or due to paths ending on the cliffs. There are more beautiful and less dangerous trails on Sithonia around Sykia, for example.